Snapchat is one of many services that offers a scannable code if you scan the code from within the correct app, that is. You can do that with Instagram, Twitter and Facebook Messenger too, and I’ve written about all of ’em: Create an Instagram Nametag, Create a Facebook Messenger Shortcut and Make yourself a Twitter QR Code. So there’s your snapcode, right at the top and ready to screenshot and share if you’re so inclined. But hold on there, mate! 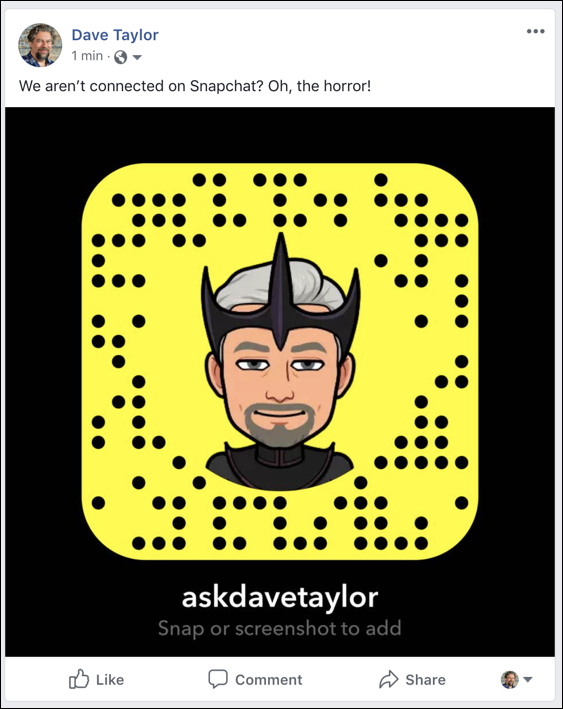 Snapchat has some pretty nice tools to help you fine tune your Snapcode and share it across various platforms, so let’s use that instead. To get to the Snapcode screen, tap on the small yellow snapcode graphic. From here you can share what you have, but instead put aside 10-15 minutes and tap on “Edit Bitmoji”. Now you’re in the Bitmoji editor (kinda like an Identikit from the police, actually) where you can tweak your hair color, facial characteristics, outfit (you can see I have a Game of Thrones crown on!) and lots of other features. Good fun and an easy way to waste some time in a good way. More importantly, you can use the “Save Snapcode to Camera Roll” feature to get that slick snapcode saved. Now you can use it anywhere you want, on the back of a business card, projected on the screen at your next talk, as your wallpaper, even as a sticker! And that’s how it’s done. Now have fun with Snapchat as you gain more followers! Pro Tip: I have a lot of computer tutorials and both iPhone and Android help here too. Please check it out!